Bloggers are always looking for new music to review. They like discovering great new work. Until you can hire a PR person to do that for you, don’t be afraid to send yours. You have to start somewhere. Ok, you might not get reviewed, but then you might. Just for that reason, you should send your music to bloggers. For me personally, I only feature bands that I like and I will buy the music from. If I didn’t feature you, it often means I’m just not into what you are doing or the recording quality is poor, or you don’t have all your social media networks together where potential fans can like or buy your work. Sometimes, it’s because the music isn’t good at all. But remember, a lot of bloggers are doing it for the love of music. It is subjective. It’s quite easy to submit your work. Start building your music blogs database. Find out who in your region is music-blogging and then expand beyond your city. Some blogs write about a particular music genre. Make sure you send your work to the right blogs. Most of them have a specific review or promo email to send the music too, look for one on the blog. When you contact them, give a brief bio about who you are – you are not writing a novel here. If you want them to read your long bio, give them a link to it. Give a brief description of what is the music about, gig dates & information, release date and contact info. Be respectful and nice. Make it easy for them to get more information. Remember, it is about having a conversation. The bloggers won’t care about your music until they personally decide to care. The only thing you can do is share the information with them and let it be. It’s about creating relationships. Every time you release something, you should be in contact with them. It’s better to have a ‘friend’ on your side. You are the one who sets the tone for your future promos. Be personal and don’t hype. Don’t send MP3 or CDs unless it is specified. Send link(s) to your new single, EP or album for review when you at the point of selling your music, or it’s already on sale. Bloggers want to see you are serious. They will give you exposure if their readers can and will get something out of it. That means, have your band website ready, your Tumblr page set up, your Facebook, Twitter, SoundCloud, Songkick or any other relevant online profile up and running. Have your music available for sale on Bandcamp, iTunes, or any other digital online store or give them a specific date when the music is going to be released and where. For DJs, DO NOT SEND MIXES. You won’t get reviewed. No blogger will listen to an hour of a mix from tracks that are not yours. Now, you’ve sent your stuff and you didn’t get a review or a feature. Don’t stop here. Keep doing your job at being a musician, gig, create more music. Once you have more to share, send them the information. 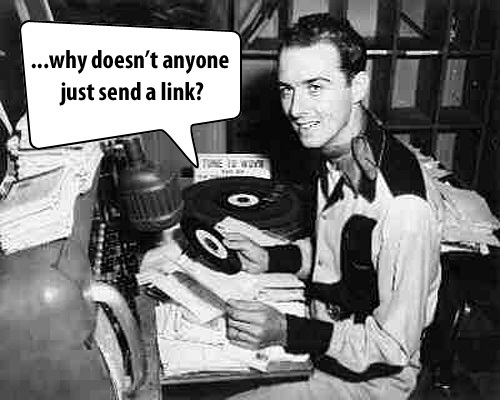 Bloggers receive tonnes of emails by bands wanting to be reviewed and, most of time, they won’t reply. If you create great music and you have personality, you will be picked up one day.